Private One-on-One Coaching gives you extra support and individualized attention saving you valuable time. 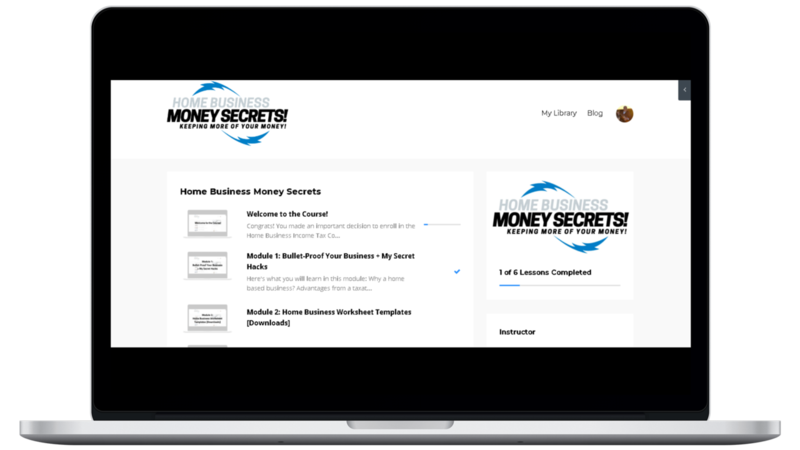 For 10 years I've been figuring out how to help Homepreneurs to get organized, maximize deductions, reduce taxes, and easily be ready for tax season. Let's work together and put you on the fast track to turning every day expenses into profits! 9 SELF-PACED VIDEO LESSONS covering home-based business record keeping and legitimate deductions; so you can start capturing your tax savings right away. PDF COURSE MANUAL, TRANSCRIPTS and MP3's of the VIDEO LESSONS, so you can follow the video lessons and make notes. BUSINESS EXCELLENCE TEMPLATES so you can stay current, organized and ready for tax season with little effort. TAX SAVINGS ESTIMATOR APP so you can calculate anyone's savings. Go ahead and click the "Complete my purchase" button now. Enter your Name, E-mail and Credit Card information. Click the "Complete my purchase" button, you'll receive an e-mail where you can immediately print your receipt (this is a 100% tax deduction), get your log-in and password, download your course materials, and start the course RIGHT NOW.